My Loan Quote connects homeowners to approved HARP lenders online when their mortgages are greater than their home value so they can cash in on the best refinance terms online. MLQ can help you find approved HARP mortgage lenders in all 50 states. We help underwater borrowers find trusted loan companies that provide refinancing under the HARP 2.0 plan. The HARP refinance program was introduced in the early days of President Obama's first term but the relief effort wasn't really well-received until the second version was rolled out with significant changes being made to the underwriting criteria. The first release of the Home Affordable Refinance Program allowed HARP lenders to approve refinancing up to 125% loan to value. Unfortunately, not enough people qualified and the Obama Administration requested that Fannie and Freddie go back to the drawing board to revise the guidelines so that more upside-down homeowners were able to meet the requirements for a HARP refinance loan. HARP 2.0 removed the 125% limit and encouraged HARP mortgage lenders to approve loans to borrowers regardless of how much equity or lack of equity could be measured in today's market. Will refinancing lower my payments? How might a HARP refinance loan benefit me or my co-borrower? The objective of the Home Affordable Refinance Program is to provide worthy homeowners who have demonstrated the ability to pay their mortgage on time the opportunity to get an improved interest rate on a new mortgage so the borrower can save a lot of money over time. Talk to approved lenders about HARP loans. Can I qualify for a HARP mortgage on a second home? Yes, the recent updates from Fannie and Freddie that the HARP 2.0 was available for vacation home refinancing and investment homes in some instances as well. For example: Many homeowners have a primary residence in California, but also have a vacation house in Arizona, Colorado, Nevada, Idaho or Utah. The borrowers may be eligible for a HARP refinance on the mortgage for these 2nd properties. Homeowners whose interest rates are much higher than the present market rate should see an immediate reduction in their payments. Homeowners who are paying interest only, who have a low introductory rate that will increase in the future, or who face a balloon payment may not see their current payment go down if they refinance to a fixed rate and payment. These homeowners, however, could save a great deal of money by reducing the amount of interest you pay over the life of the loan. Did you know that in 2013 HARP mortgage rates fell to their lowest level since September of 2012? Will I need mortgage insurance on a HARP refinance? If your existing loan has insurance held by a private mortgage insurer (PMI), you will likely need the same amount of insurance to cover your loan under the HARP refinance program. If your existing loan does not have private mortgage insurance, it will not be required as part of a refinance under HARP. With My Loan Quote, you complete one simple form online and 3 to 4 lenders that are approved for the Home Affordable Refinance Program will contact you, in an effort to win your business. After getting your questions answered, you will be able to shop HARP refinance offers for comparing rates, closing costs and terms so you can select the company you are comfortable with. For live home refinancing advice, call us toll free at any time. My Loan Quote is committed to guiding homeowners into low rate mortgages regardless of their fico scores. We have received rave reviews from thousands of homeowners regarding our 100% home mortgages. Shop with Top HARP Lenders in 2013! Refinancing your existing mortgage can be smoother than you think. 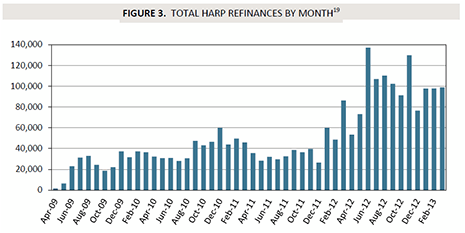 Most HARP loans are closed within a month. Apply Now for a HARP refinance loan with a fixed interest rate. Search our network of HARP lenders and underwater program options. Up to 4 approved loan companies will contact you to discuss your needs and HARP loan eligibility. You select the HARP lender that best meets your qualifications and refinance goals. MLQ is headquartered in Irvine, California but we offer HARP refinance Loans are available in all 50 states. However if you are living in the Golden State, we will connect you with HARP lenders in California first. The interest rates on these loans may vary depending on closing costs and which HARP lender you choose to work with. Additional limitations may apply with the Home Affordable Refinance Program. Please be aware that Fannie Mae and Freddie Mac could change HARP requirements at any time without notice. Call My Loan Quote for more information, and further details regarding the HARP refinance underwriting guidelines.